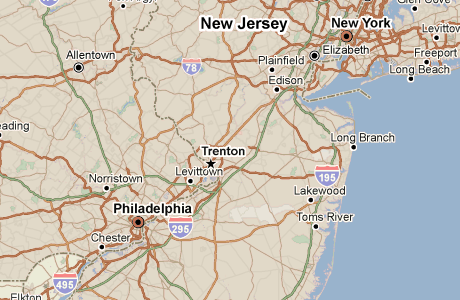 digital resource offered through the New Jersey State Library. Tell a compelling story using maps and data. Support your stakeholders who need location-based information to find local solutions, create new initiatives, prepare grants, or respond to community needs and demands. This service is available for remote access to state employees and Thomas Edison State University staff and students, as well as being available for use onsite in the library to any patron or visitor. 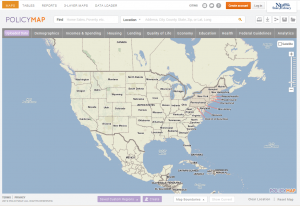 Using data from a variety of sources along with easy to use online mapping tools, researchers can compile customized maps pertaining to demographics, real estate, health, jobs, education and more. A number of quality of life data sets and data points are also available, which can provide a more intricate profile of communities. Users can generate results that contain state-to-state comparisons or localized results based on counties, zip codes or even census tracts. Data can be layered with up to 3 different data sets. Data points can also be added to give a larger snapshot of local situations. 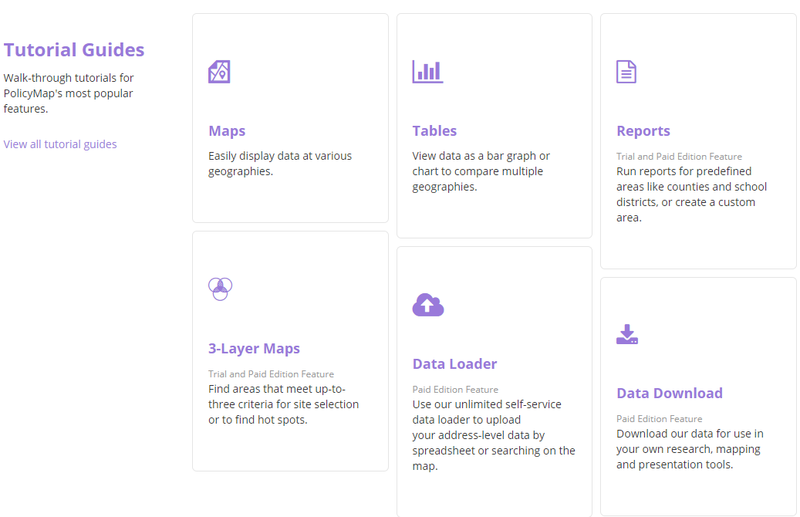 In addition to the data sets offered through PolicyMap, users can also upload their own data in order to create customized results. 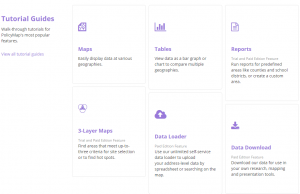 Once a map is created, it can be saved or downloaded or shared with others. 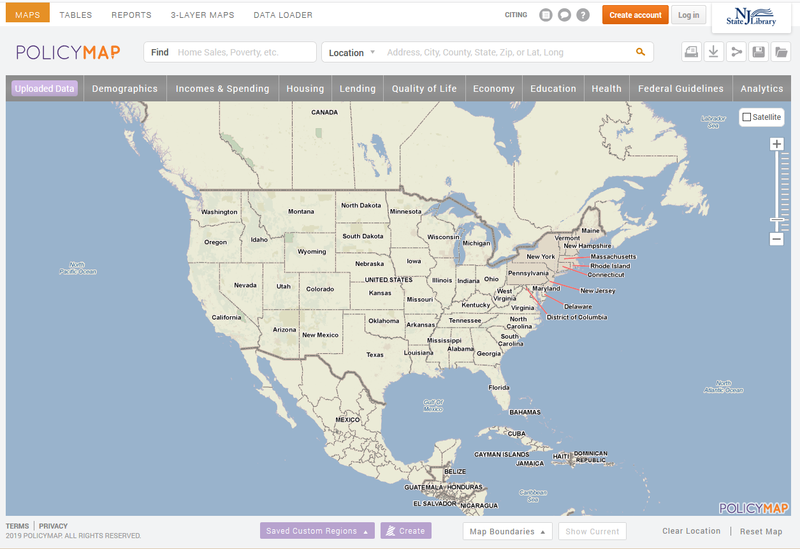 PolicyMap provides a variety of training resources including walk through tutorials on popular features. A downloadable (pdf) primer with a summary of all the product’s features is available in addition to recorded webinars that you can watch at your own pace. Ongoing free, live webinars provide guided assistance on particular features. 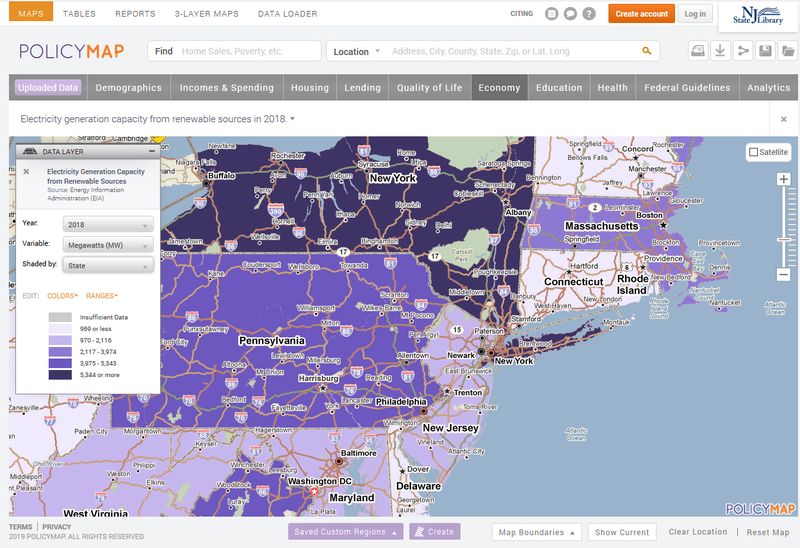 PolicyMap is a powerful tool that can help drive decisions based on real data, in real places. If you have questions about PolicyMap or other resources available through the State Library’s Research Library, call or visit us. Email Reference Services at refdesk@njstatelib.org or call (609) 278-2640 x 103. To contact our Law Library email us at reflaw@njstatelib.org or call (609) 278-2640 x 102. Come visit the State Library at 185 W. State Street in Trenton, between the State House and State Museum.